​​DALLAS - Work crews have quietly started preparing for construction of the two-tower Union complex just north of downtown Dallas. The $200 million office, residential, and retail development on Cedar Springs Rd. 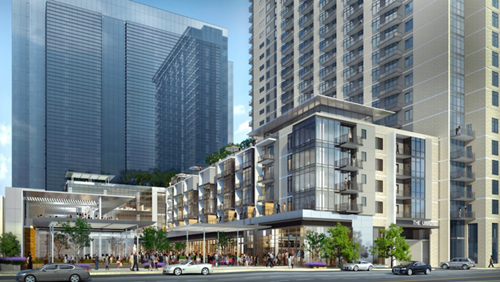 is one of the largest new projects in the works for Uptown. Located just a block north of Woodall Rodgers Fwy., the Union will include a 22-story office tower, apartment high-rise and retail and restaurant space. Tom Thumb will have a 60,000-sf grocery store in the project when it opens late next year.